Thinking of the global development in the past twelve months, the political crises and unrests, the wars and the terrorist attacks, 2016 wasn’t one of the best years. For me it was a year of mixed feelings. While I would describe the first seven months of 2016 as generally pretty good, the last five months weren’t that great and only had one real highlight. 2016 wasn’t by far as epic as 2013 and 2014 were and also couldn’t measure up with 2015. Nevertheless, there were enough highlights to reminisce about in a travel blogger review 2016. Between March and July I was lucky to meet my friends Mill and Leon, who both live in Beijing, a few times. Leon was leading tours groups through Europe and we met when he passed through Frankfurt. Furthermore we met when I was in Beijing in May. There I also met Mill. 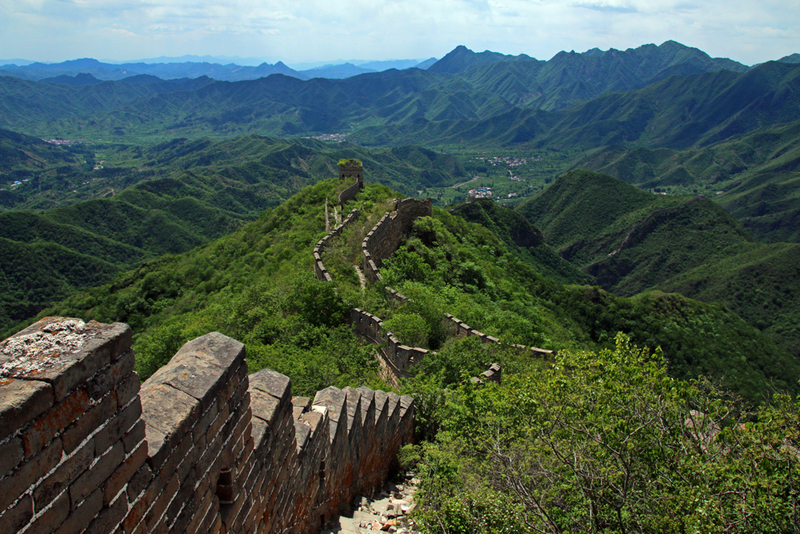 We did two hikes on two different unrestored sections of the Great Wall. 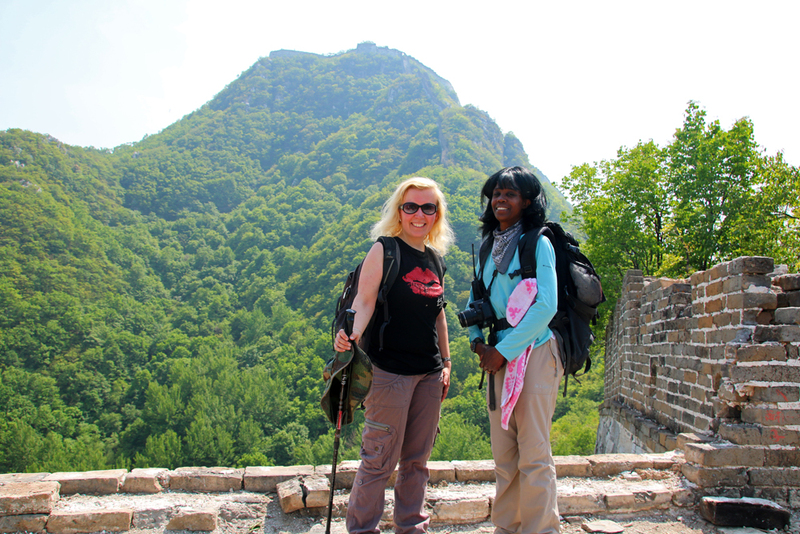 Our first hike took us to the Jiankou ‘Big West’ Great Wall, a wild, derelicted and overgrown with trees and bushes part of the Wall. 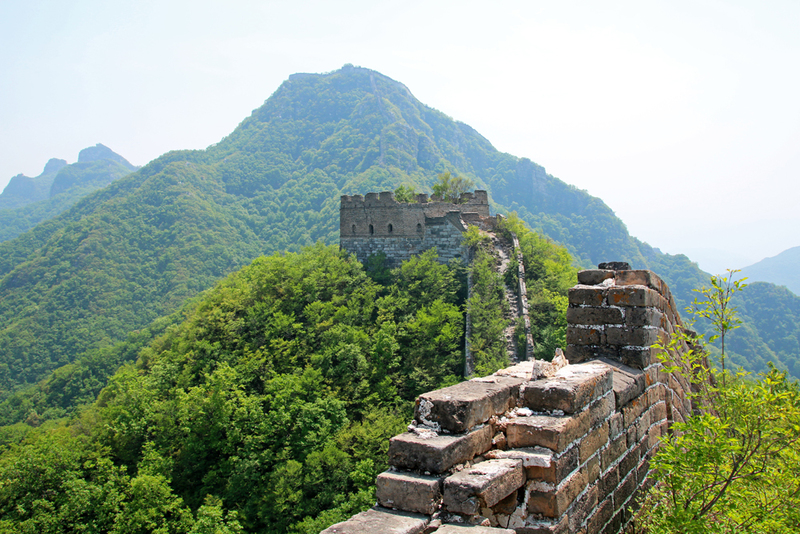 The second hike was called ‘the Great Wall Spur’ and led over steeper but better preserved and less challenging paths. 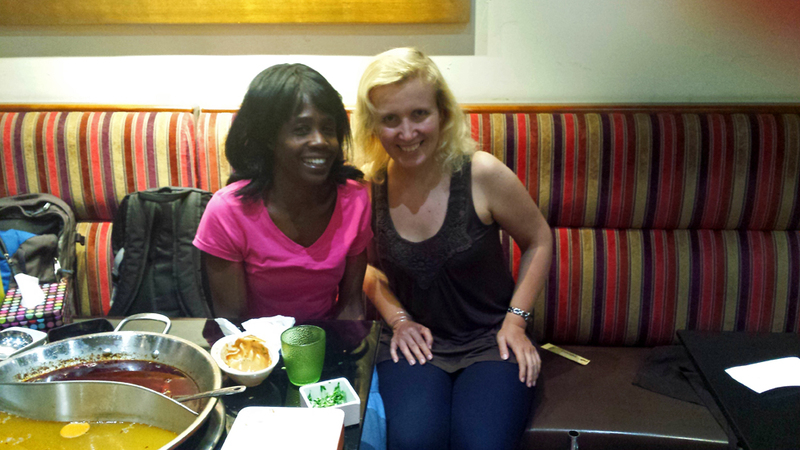 Another night Mill and I met in a typical restaurant in Beijing where we indulged a fiery Sichuan Hot Pot dinner. 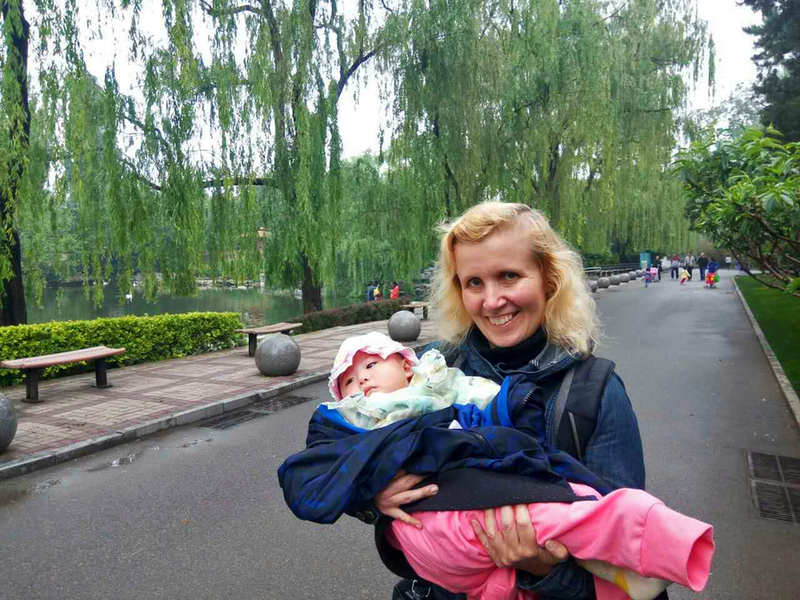 My trip to Beijing in May was the most spontaneous trip to China I ever took, even more than my spontaneous journey to Beijing in March 2015. In late April 2016 I called the visa service centre of the Chinese Consulate General in Frankfurt and asked when would be the earliest date my visa could be issued. I booked my flight for that date, drove to Frankfurt and applied for my visa in person right after. Only four days later I could pick up my visa and flew the same day. Like on my way to Bangkok last year in October I almost missed my flight, again due to heavy train delays. I only managed to get to the airport on time because my Dad rescheduled his whole day to be able to drive me to Frankfurt. Unfortunately this trip was a mainly job-related one but luckily I still managed to squeeze in a few amazing and fun activities. 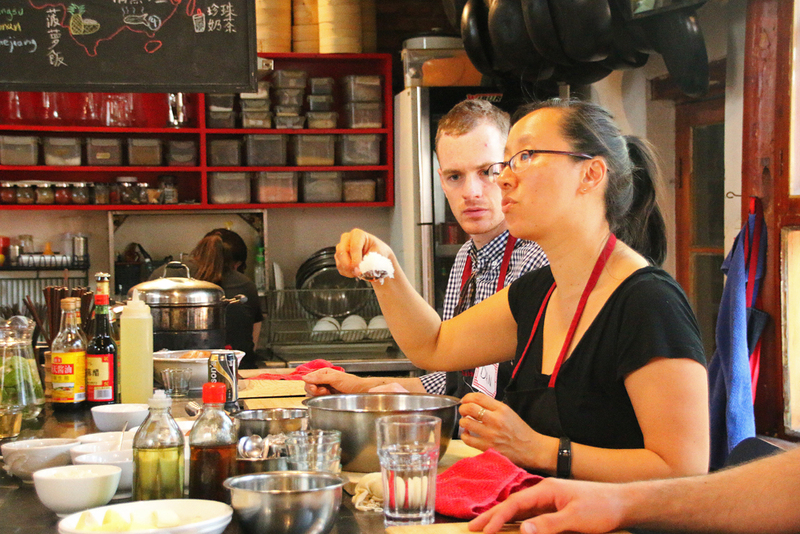 I attended a cooking class in my favourite cooking school in a Hutong in Beijing and learned how to prepare dumplings. 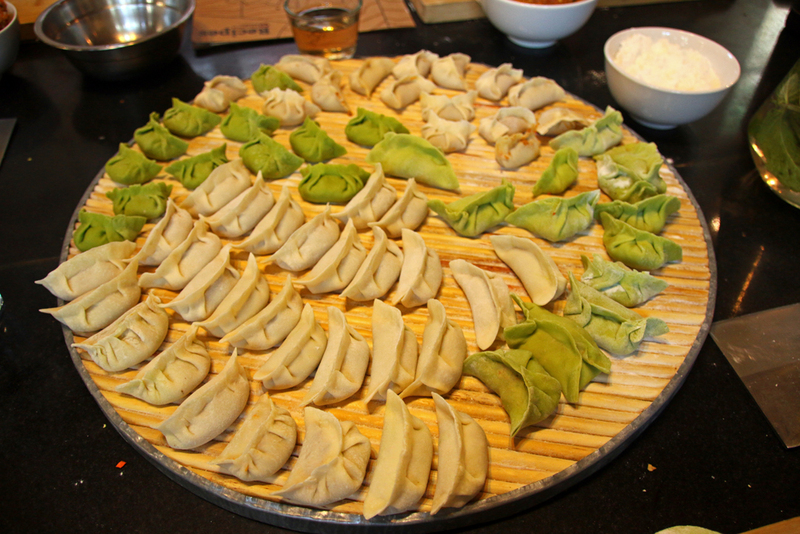 To be honest I had already prepared dumplings in a cooking class in Yangshuo in May 2013 but I wanted to try new recipes and thought that I still needed some more practice. 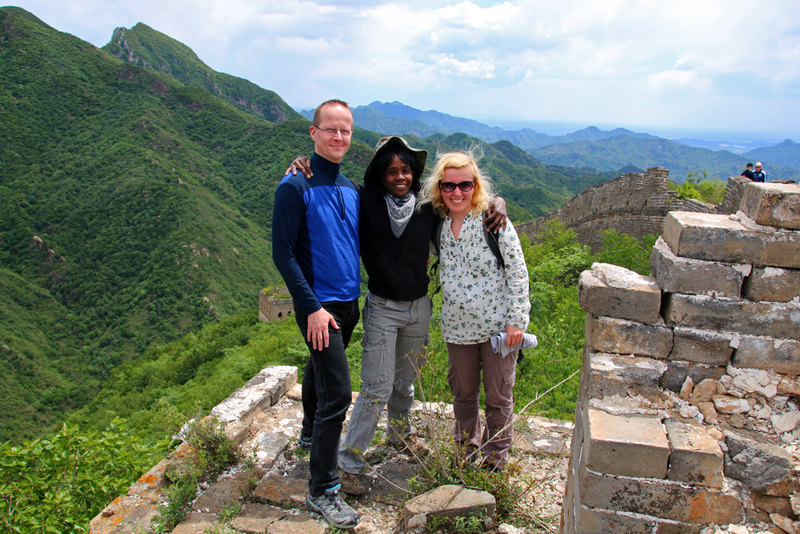 I highly enjoyed the two hikes on the Great Wall. 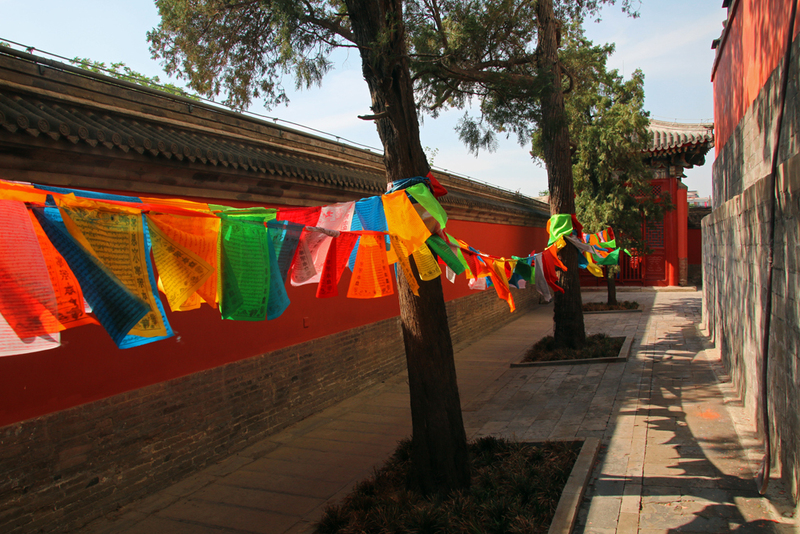 Moreover I returned to my favourite temple in Beijing, the Yonghe Gong twice and to the Beijing 798 Art Zone and the Gu Jie, the Ghost Street, once. Furthermore I also discovered sights which were new to me. I spent a rainy day in the Beijing Aquarium. Already in March 2015 I had planned to explore the White Dagoba Temple but back then it was closed for construction works. This year it was opened so that I could spend quite some time surrounding the White Dagoba, a ritual which is supposed to bring luck. 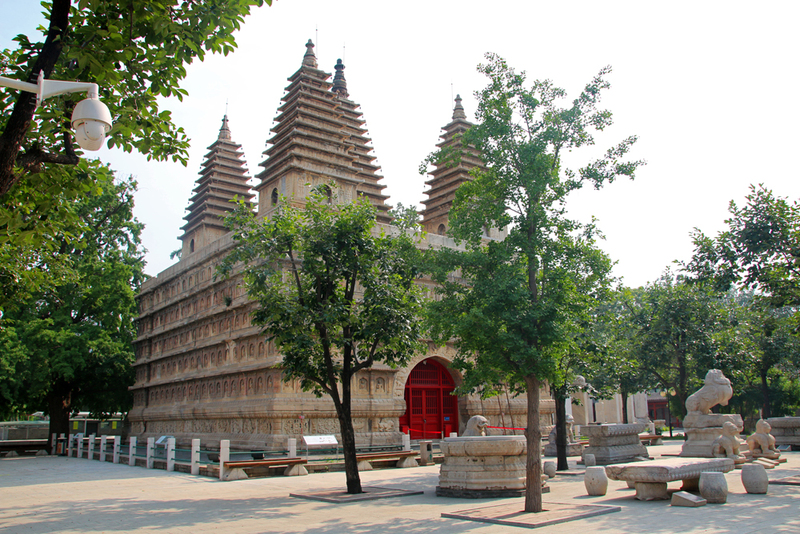 The White Dagoba Temple, also called Miaoying Temple, is a Chinese Buddhist Temple which was completed in 1279 during the Liao Dynasty. 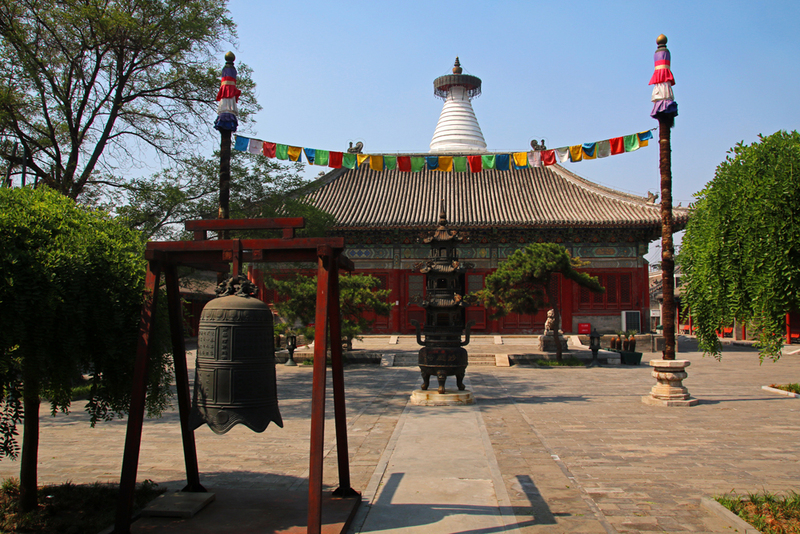 Another new temple I visited was the Five Pagoda Temple, also known as Zhēnjué Sì which was completed in 1473 during the Ming Dynasty. One of the best parts of travelling for me is getting in touch with the locals. 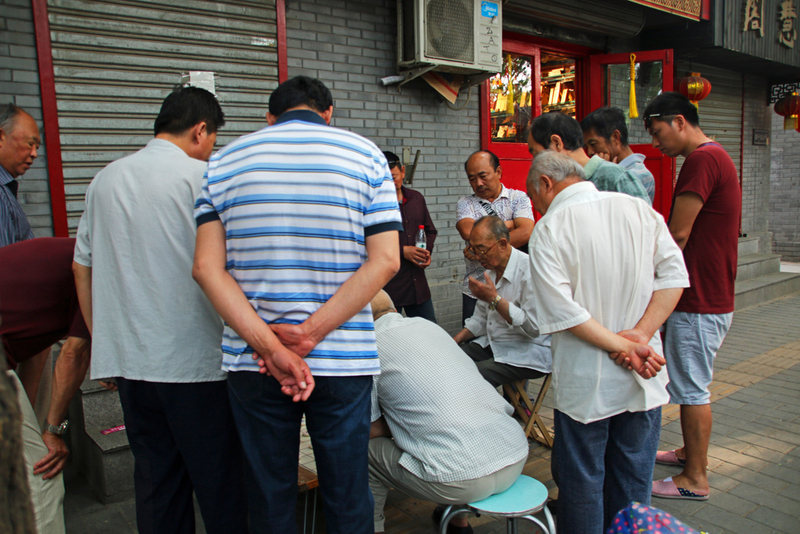 Although I couldn’t spend that much time in the Hutongs of Beijing I still had some lovely encounters. Since I wanted to get to Beijing as quickly as possible I had no time for a stopover on my way to Beijing. So I was really happy that I could spend almost two days in United Arab Emirates on my way back home. 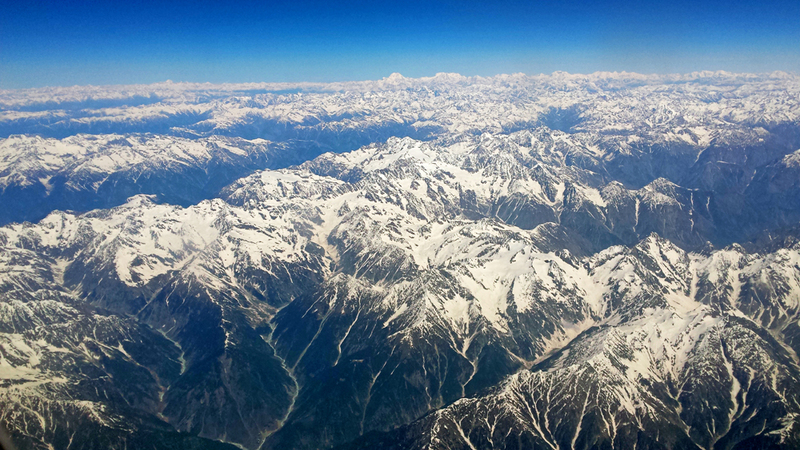 This time I took the morning flight from Beijing to Dubai so that I could see the Tianshan and the Pamir Mountains from above. 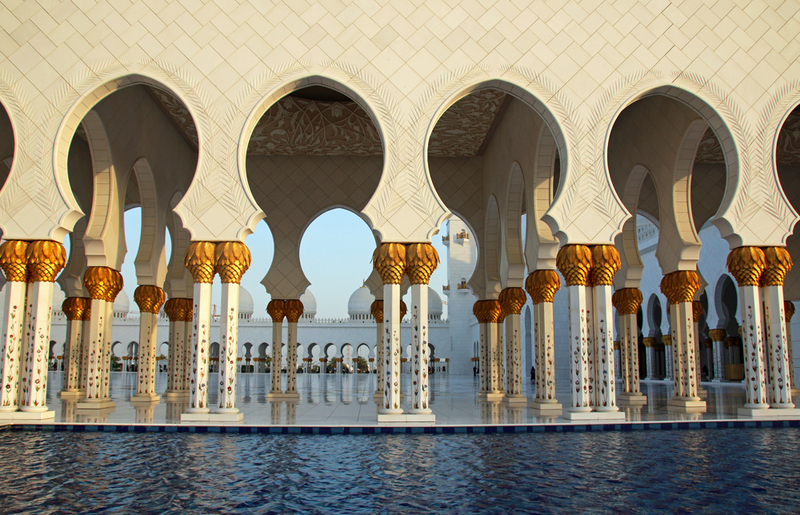 In the United Arab Emirates I finally managed to visit the Sheikh Zayed Grand Mosque in Abu Dhabi, something I had planned for long. 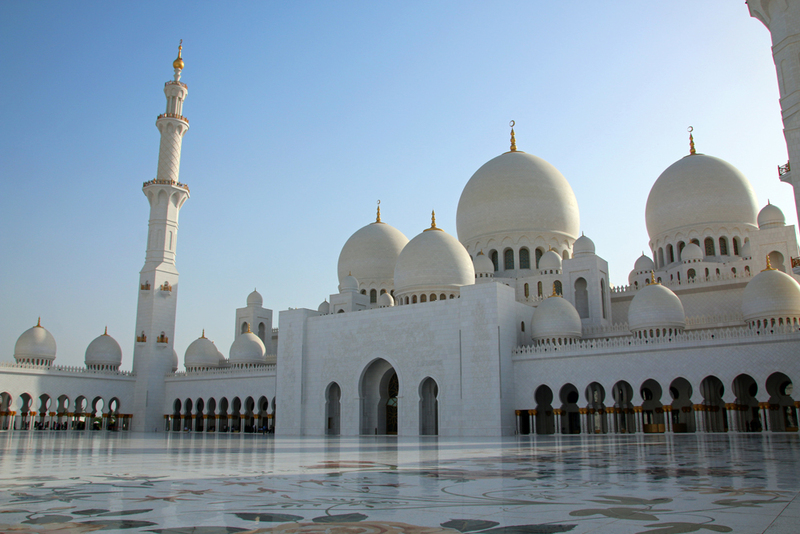 There I first attended a free guided tour before I strolled through the mosque by myself. 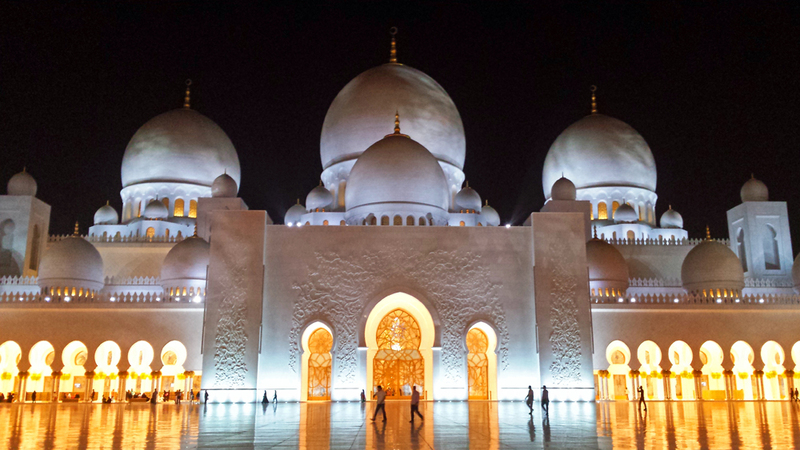 I spent a couple of hours there so that I could take photos of the mosque in the late afternoon sun and at night. The following day I joined a Heritage tour through the Al Fahidi Historic District in Dubai and enjoyed a cultural lunch at the Sheikh Mohammed Centre for Cultural Understanding. 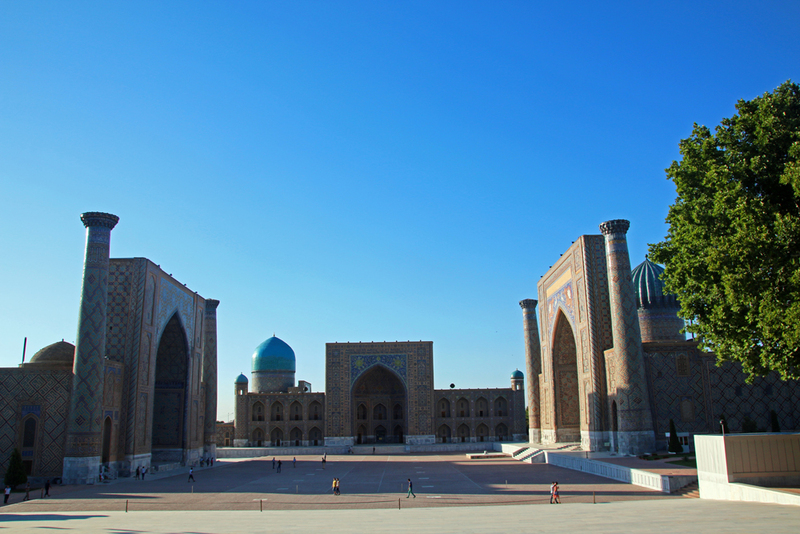 In July I travelled to Uzbekistan in Central Asia. After my arrival in the capital Tashkent I had to find out that my luggage got lost. t took five days till I could finally pick it up at the airport in Bukhara. Fortunately I had lovely travelmates. Several of the females borrowed me their clothes so that I only had to buy underwear and toiletries. 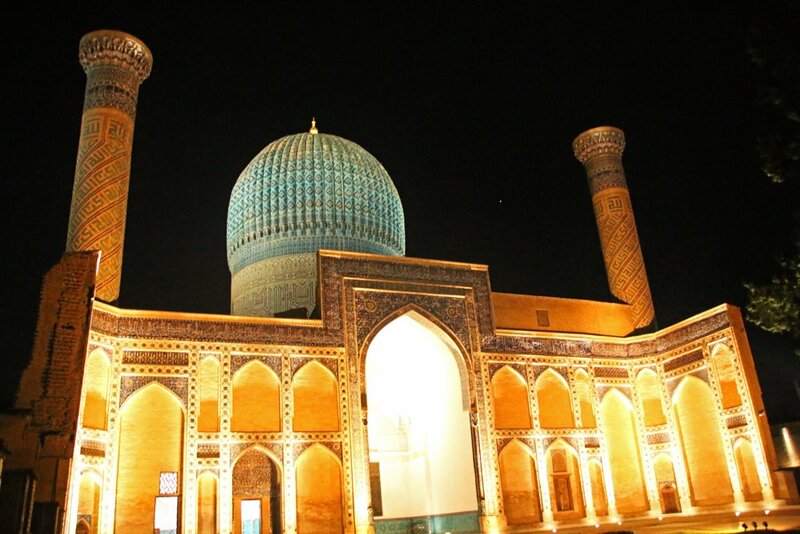 Before and after the tour I spend two full days and discovered the highlights of Tashkent by myself. 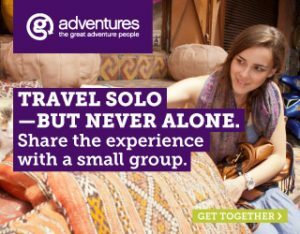 Together with the group I explored more of the country. 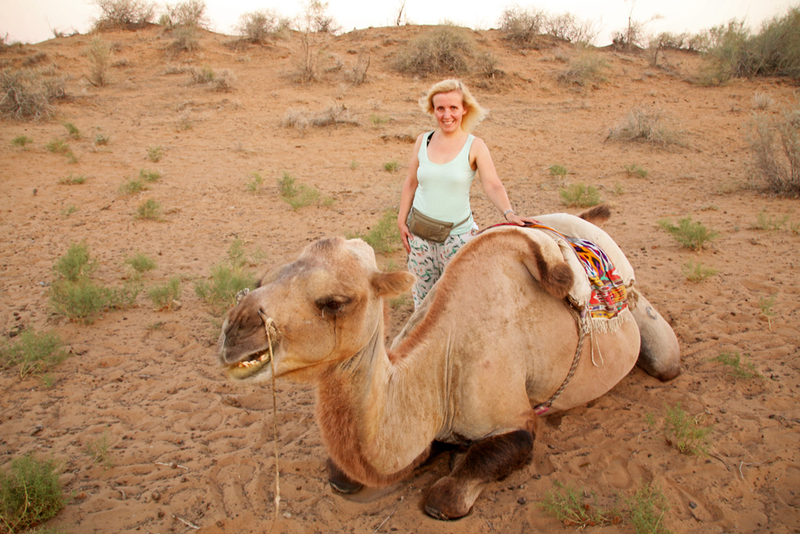 Our local guide was a young Uzbek female named Gulnoza, also called Guly, from Tashkent. My travelmates came from Australia, Thailand, the United States, Norway, the UK, Austria, Hungary, Serbia and Germany. 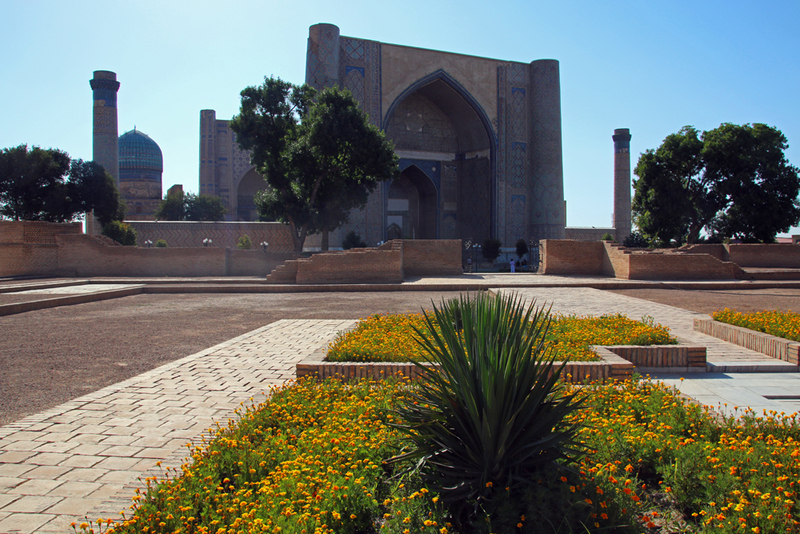 Our first stop was Samarkand, the former capital of Uzbekistan. 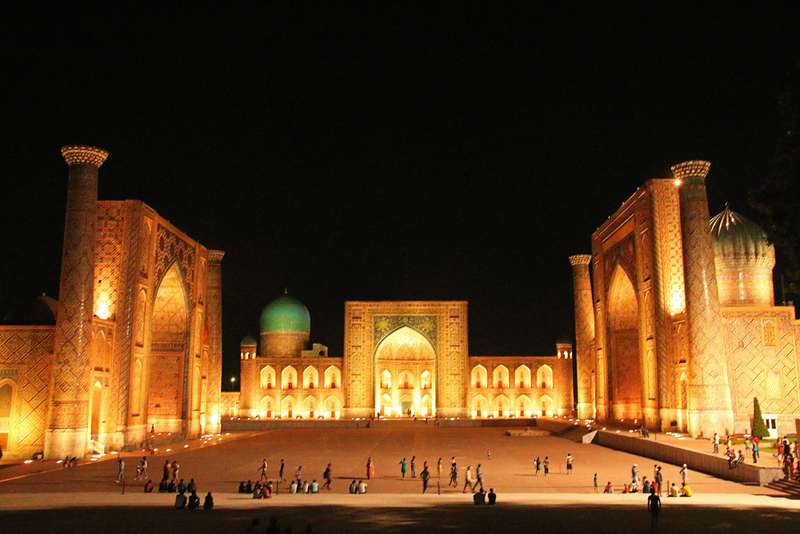 We admired the majestic Registan in the late afternoon sun and at night. For dinner we joined a local Uzbek family in their house and were given a Plov cooking demonstration. Plov is the national dish of Uzbekistan which is made of rice, lamb or mutton, carrots, onions, chickpeas and several spices. The following day we explored Gur-E-Amir Mausoleum and the three medressas of the Registan in depth. Moreover we strolled through a local market. 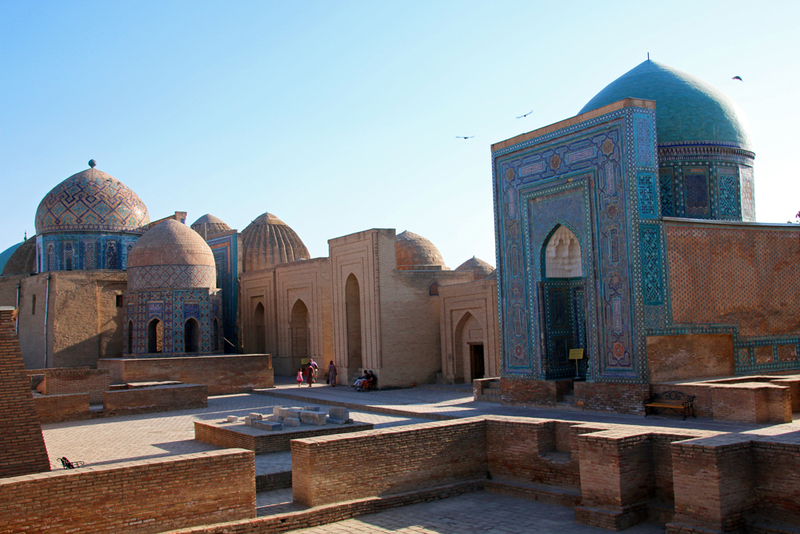 In our free time I headed to the Bibi-Khanym Mosque and wandered through Shah-i-Zinda, the Avenue of Mausoleums. At nighttime I returned to the Gur-E-Amir Mausoleum and the Registan to take further photos. From Samarkand we drove into the desert and visited Nurata on the way. Again we had lunch at a local family’s house. 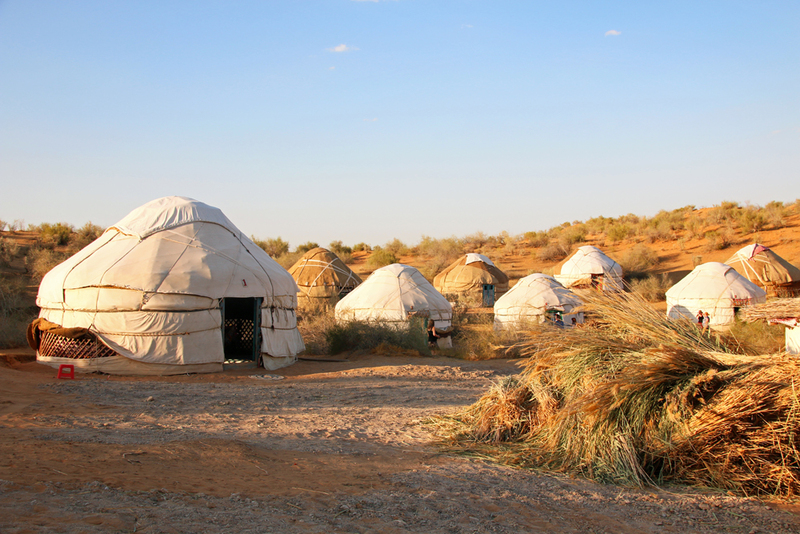 We swam in Aydar Kŭl lake, rode camels in the desert, enjoyed local live music around a campfire and slept in yurts. 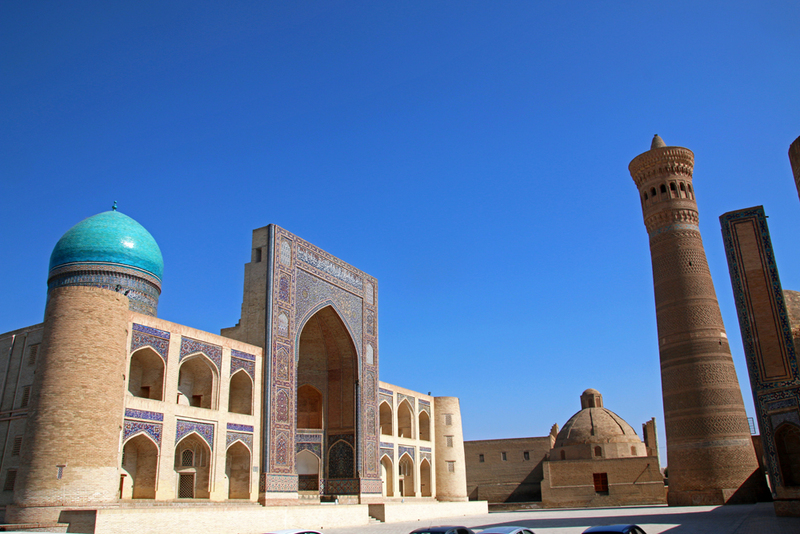 After our stay in the desert we headed back into civilization to Bukhara where we marvelled the Poi-Kalon Square consisting of the Miri-i-Arab Medressa, the Kalon Minaret and Kalon Mosque. We discovered the Samanid Mausoleum, the Ark and further medressas. We enjoyed the laid-back atmosphere around Lyabi-Hauz and strolled through the dome covered markets. Strictly divided by gender a few of us visited a local Uzbek hammam. 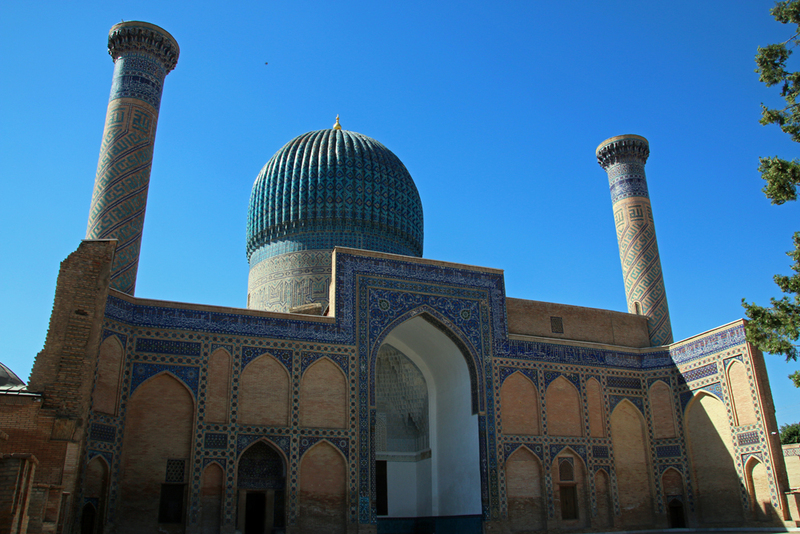 In our free time I headed to Chor Minor and spent more time exploring Bukhara by myself. 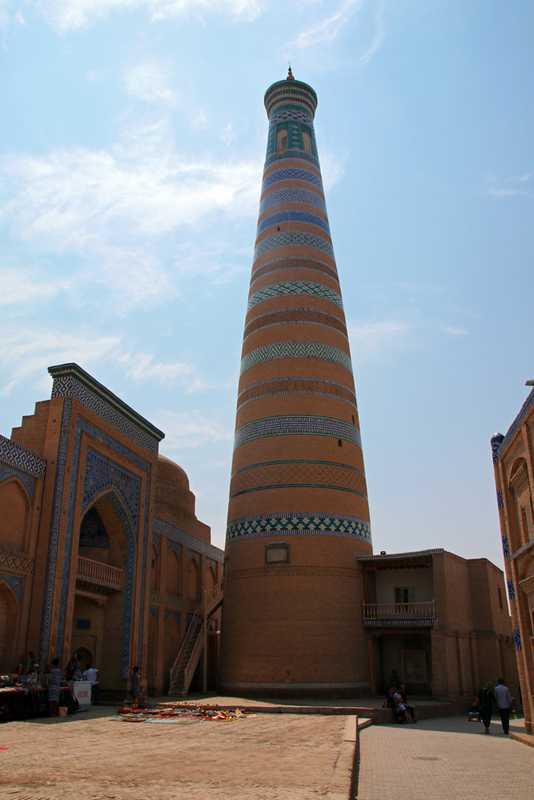 In Khiva we wandered through the inner city also called Ichon-Qala with the remarkable Kalta Minor Minaret. 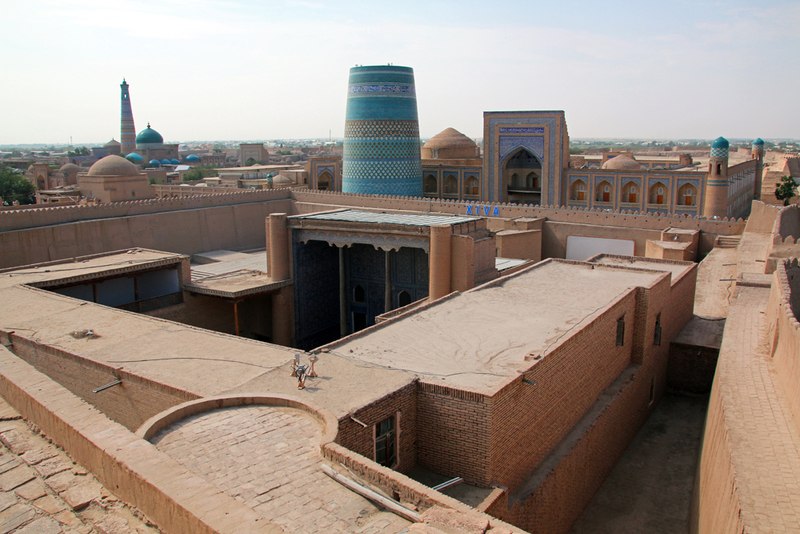 We climbed on the city wall of Khiva and visited the Tosh-holvi Palace, Kulna Ark and the Juma Mosque. 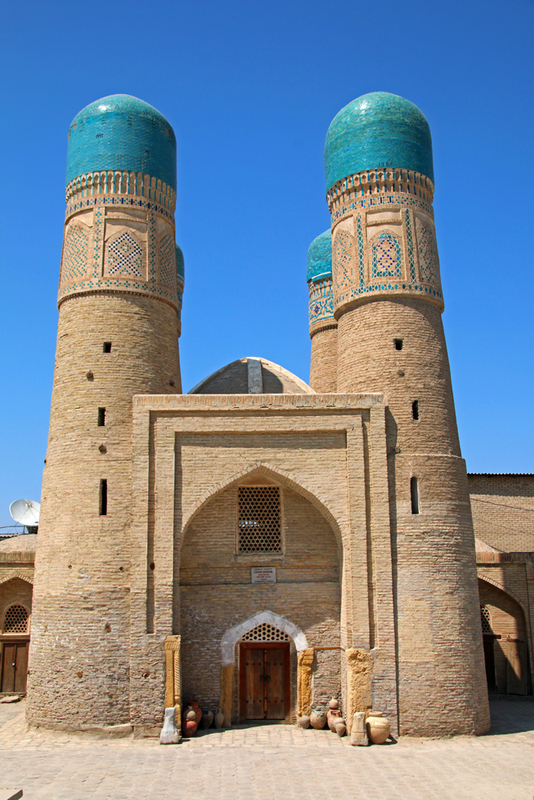 I climbed on both, the Juma and the Islom-Hjoa Minaret and marvelled the city from above. 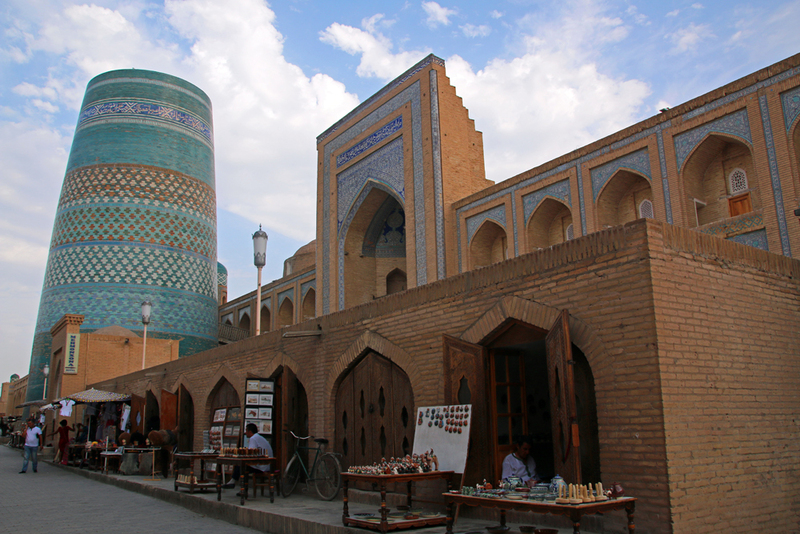 From Khiva we drove to Urgench where we took the overnight train back to Tashkent. 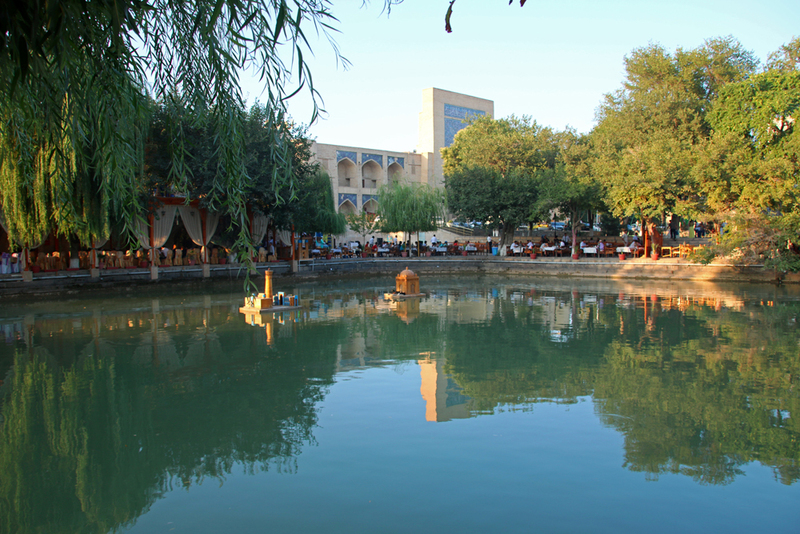 We spent one full day in Tashkent with the group before the tour ended in the evening. I had the complete following day for myself before taking the night flight via Istanbul back to Germany. Like my longterm readers might know I planned to start learning Mandarin-Chinese since late 2014, but at the latest since I attended a trial lesson in a Chinese language school in Beijing in March 2015. I knew a few words which I frequently need in China before but I would like to be able to have simple conversations in Chinese. I had always planned to learn Mandarin in Beijing but then I realized that it might make sense to get the basics in a language class in Germany. Since mid-October 2016 I am attending a Chinese-Mandarin class at the East-Asian Institute of the university of Cologne. Our teacher is a Chinese native who speaks fluently Mandarin, Cantonese and German. Little did I know in advance that I would not only learn Chinese speaking and understanding but also reading and writing. Reading and writing the Chinese characters is tough but learning Mandarin-Chinese is a lot of fun. I really hope that the next Chinese course which starts in mid-April, will fit into my schedule. Writing my travel blogger review 2016 I have to say that it was a year of mixed feelings. I really hope for a happy, healthy and peaceful but also fantastic, awesome and epic year 2017 filled with great experiences. May it be able to measure up with 2013 and 2014. I hope for more time with friends from Germany and abroad, fantastic and memorable experiences and amazing travels. I wish all of you a happy, healthy and peaceful new year 2017, full of adventures, friendship and amazing experiences.